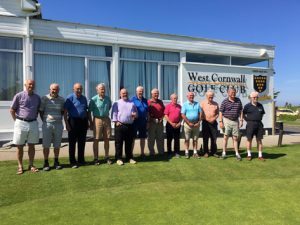 On Friday 26 May in glorious weather we held the annual Old Penwithians Golf Day at the West Cornwall Golf Club in Lelant. Twelve old boys participated with Trevor Ward (65) driving down from Billericay and Alan Perkins (52) making his annual pilgrimage from Trowbridge to accompany the Cornish based players. Thankfully the prizes were evenly distributed. The longest drive on the 18th hole was won by Trevor Ward and the nearest the pin on the 15th hole was won by Jim Glover (47). The stableford competition to decide the winner for the day was extremely close with 3 players on 33 points, Jim Glover, Frank Blewett (55) and David Morgan (60). Using the traditional method of countback on the last 9 holes we still could not split Frank and David and eventually by taking the scores over the last 6 holes David Morgan emerged as the winner by 1 shot and he received the engraved flask. A consolation prize was awarded to Frank for coming second. The prize for the best score by a visitor to the club was won by George Curnow (55) who plays at Falmouth GC. The flask was donated by the OPA but all the other prizes were generously donated by Roger Dugdale (52) of Penwithian Wholesalers. All the players plus Stuart Guppy (52), our secretary, and a few wives then enjoyed a celebratory drink in the 19th Restaurant, where there were many stories of the round and even more of past schooldays. We look forward to staging the 2018 Golf Day in Lelant and welcoming even more old boys.